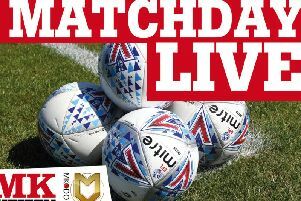 The fight for survival was dealt another hammer blow on Saturday as a life-less MK Dons slumped to an embarrassing 4-0 defeat to Rotherham. Behind after just 54 seconds after Matt Derbyshire’s goal, Dons were two down on quarter of an hour when Leon Best converted a penalty after Cody Cropper cleaned out Richard Wood. Showing no signs of a fight back at any stage, Kirk Broadfoot made it 3-0 early in the second half before a wonderfully struck volley with 11 minutes to go from Richie Smallwood completed the rout. Fulham’s late winner against Cardiff means Dons are now cast nine points adrift of safety with five games remaining. After the disappointment of Tuesday night, Dons reverted to the side which started against Fulham a week earlier. Alex Revell led the line against his former club, while Dean Bowditch, Jonny Williams and Josh Murphy all returned to the attacking quartet. Dons couldn’t have made a worse start, and were trailing after just 54 seconds, once again caught on the counter from a corner. As Lee Camp caught Dons’ early corner, he started the break, with the ball finding Grant Ward on the right. Out-pacing Jake Forster-Caskey, he put in a relatively straight forward ball to the near post to Matt Derbyshire, whose initial effort was well saved by Cody Cropper, but the former Blackburn man made no mistakes in roofing his second effort, putting the Millers into the lead. The mission was made even more difficult after 15 minutes when Rotherham doubled their lead from the penalty spot. The ball came loose in the area, and while it looked easy for Cropper to collect, Richard Wood put himself between the ball and the keeper, drawing the foul and leaving referee Iain Williamson no choice but to award the spot kick. Leon Best sent Cropper the wrong way to make it 2-0. Dons simply weren’t at the races in the first half. Looking uneasy, unsure and lost, it was only the offside flag that prevented them going 3-0 down when Best was left unmarked at the far post to head past Cropper. The American needed to be on his toes to deny Derbyshire’s effort from the edge of the box too as Rotherham poured forwards, full of confidence and gusto. The home side saw more of the ball in the latter stages of the first half, but offered nothing to challenge Rotherham keeper Camp. It was as poor a Dons showing as there has been this season. And it got worse eight minutes into the second half as Rotherham skipper Kirk Broadfoot put the icing on the cake for Neil Warnock’s side, rising high above the Dons defence to not home Joe Newell’s free kick to make it 3-0. It wasn’t until Carl Baker and Samir Carruthers were introduced with 23 minutes to go that Dons began to really show any signs of life, but their flurry of life was more a muscle twitch than a full blown revival. Jake Forster-Caskey first made Camp fly to his left to keep out his well-taken free kick, before beating the keeper all ends up 30 seconds later, only to be denied by the bar. And so it proved as Rotherham rubbed salt in the wounds 11 minutes from time. A Rotherham corner was only half cleared to Richie Smallwood hovering on the edge of the box for a loose ball, and he sent his volley high but it dipped perfectly into the top corner to give the 2,900 travelling fans an afternoon to remember.